Self care is important but looking after our mental health and emotions often comes at the bottom of our task lists. So how about making a change for 2019? 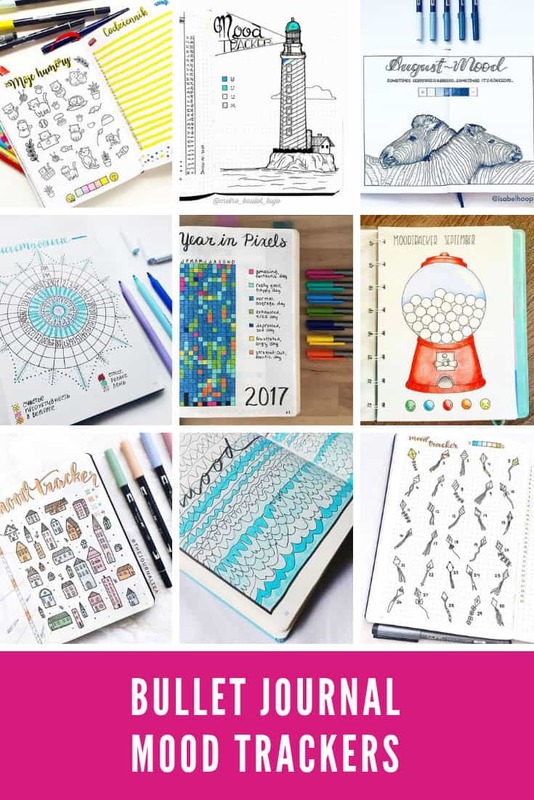 We’ve got creative mood tracker Bullet Journal ideas to inspire you! 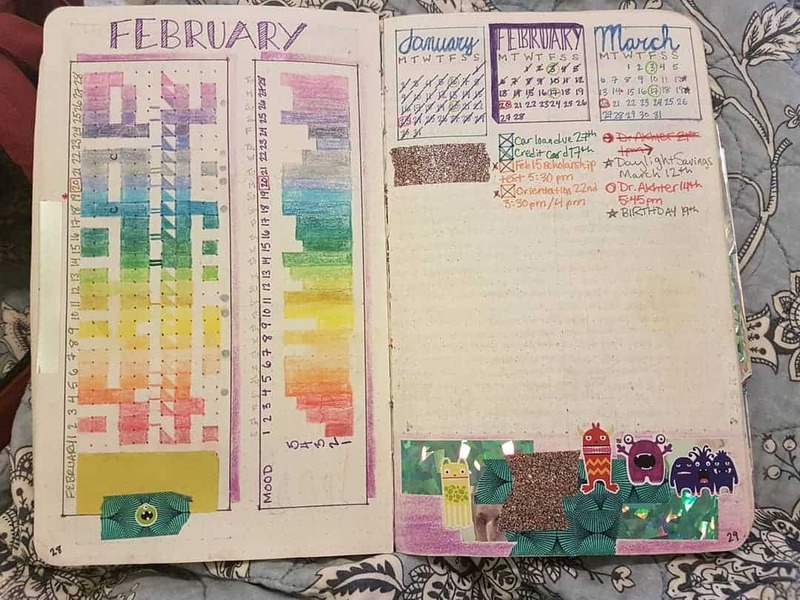 It’s time for another fabulous collection of Bullet Journal Tracker layouts. 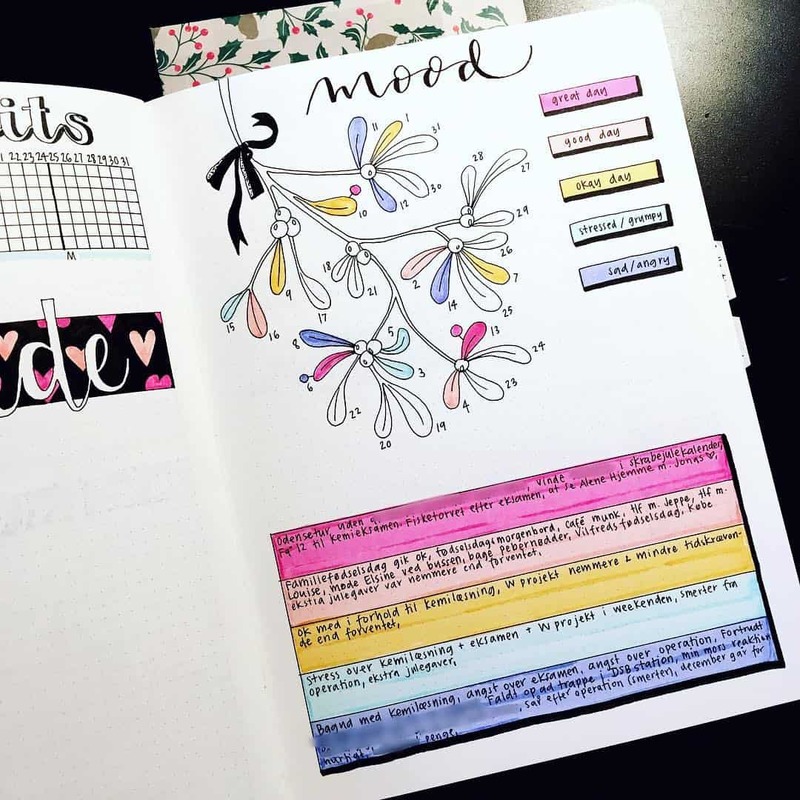 If you have been noticing that you find yourself easily triggered, falling into certain negative moods, or that you can’t seem to change your mood when you need to then you should think about using a mood tracker in your Bullet Journal. 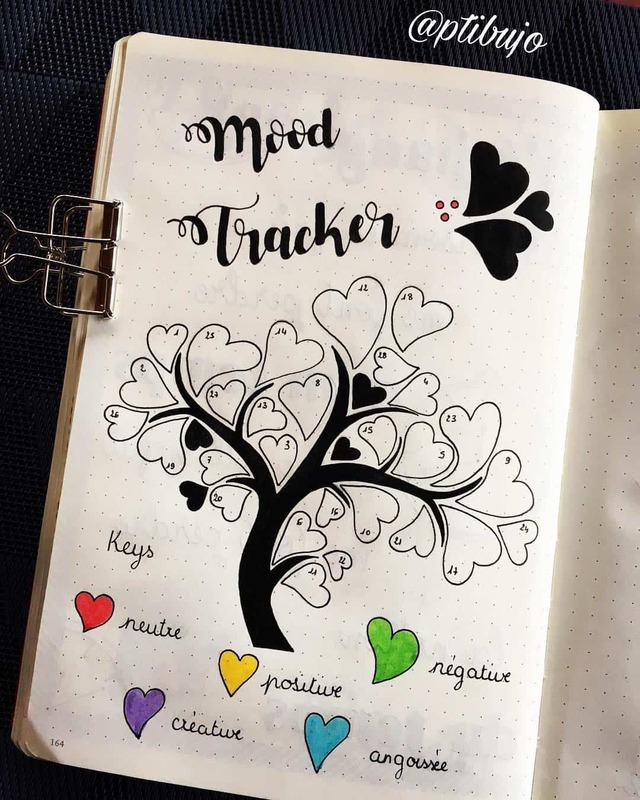 Mood trackers can help you figure out what put you in a certain mood, but also what to focus on to remove negativity from your life and reduce bad moods. 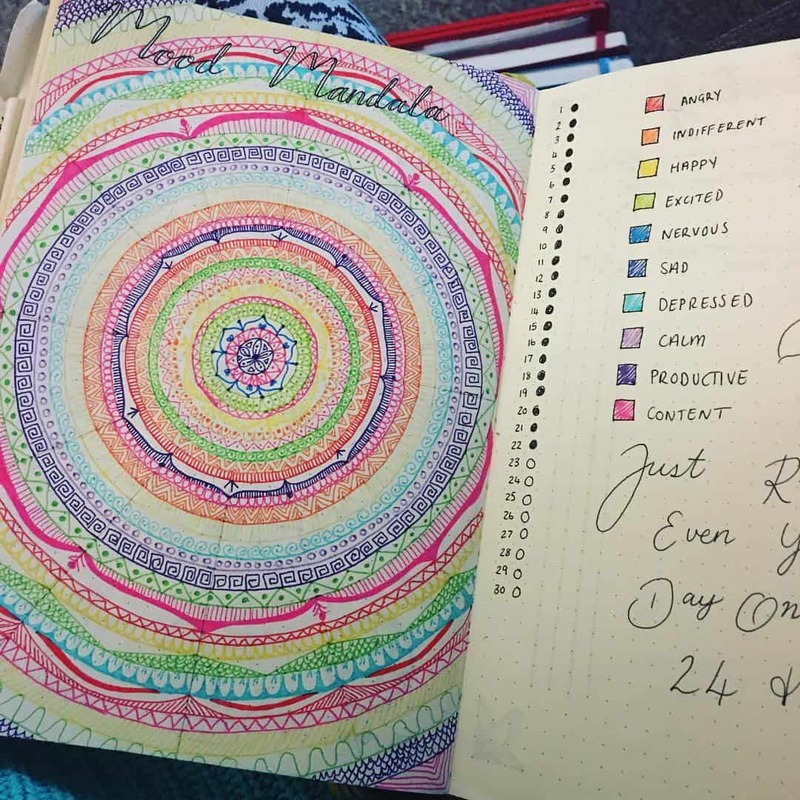 If this sounds like something you want to do, here are some ways to create and use a mood journal in your daily routine. 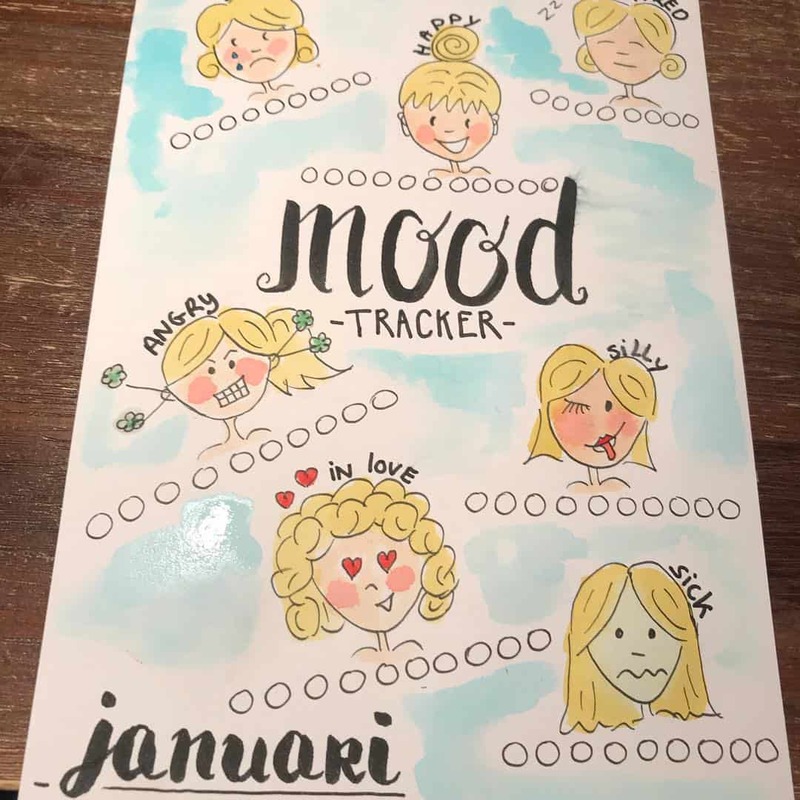 A mood tracker can be set-up in various ways. One way that people find that works well for them is to have a strip at the top of each daily page that has various faces. These faces range from a full smile to a full frown or even pain. This allows you to simply pick the emotion you are feeling. Underneath this strip of faces can be other strips or just an area to write your thoughts on your mood. Other strips that you can use are scales that show how happy or sad you are. You can also expand on these as you need to. Mood trackers are perfect for moments in your day when you find yourself in an extreme of a mood. Most people start mood trackers as a way to focus on why they may be sad, depressed, or feeling anxious and work through those issues. 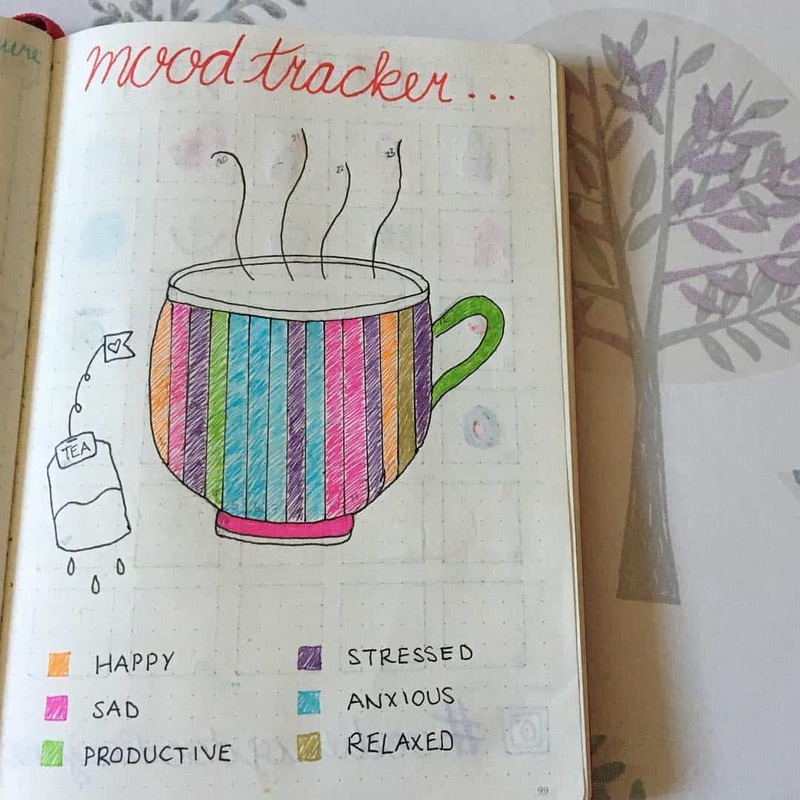 Many users of mood trackers feel a rush from seeing their lives and their entries go from a negative extreme to a more positive feeling over a period of time. 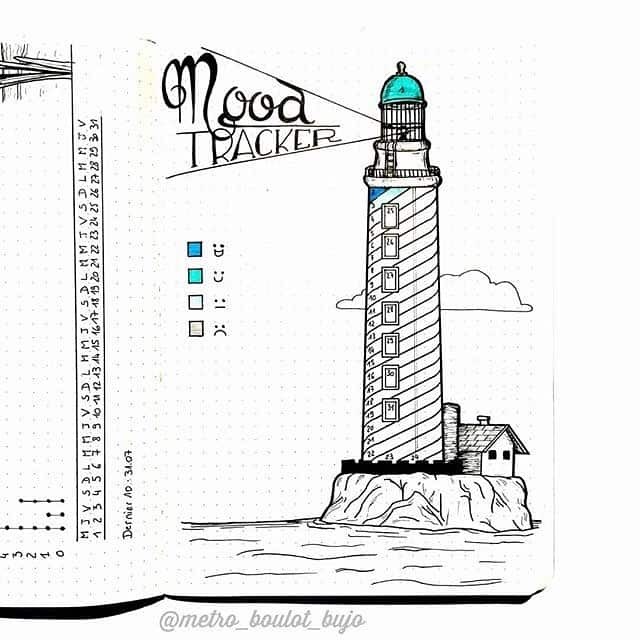 The mood tracker helps you focus on you. That may sound odd, but if you are going through an emotional or mood extreme you may focus on the problem or emotion and not on yourself. By writing down your thoughts and recognising the emotion or mood connected to them you can help bring the focus back to you and making your life a bit better from the journal entries and routine. Mood trackers are similar to trigger trackers in the sense that both are done at the time of the emotion. 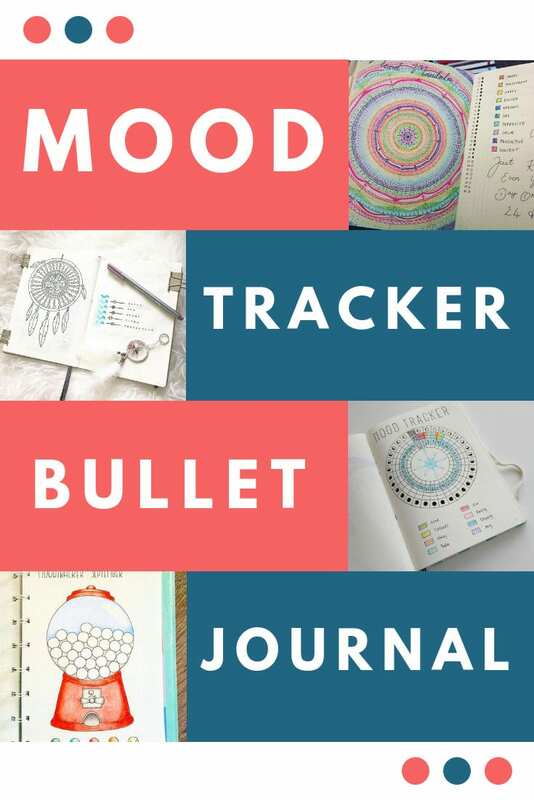 This means they should be an option that is easy to take with you and easy to use when you need to journal, which is why it makes perfect sense to put your mood tracker in your Bullet Journal! 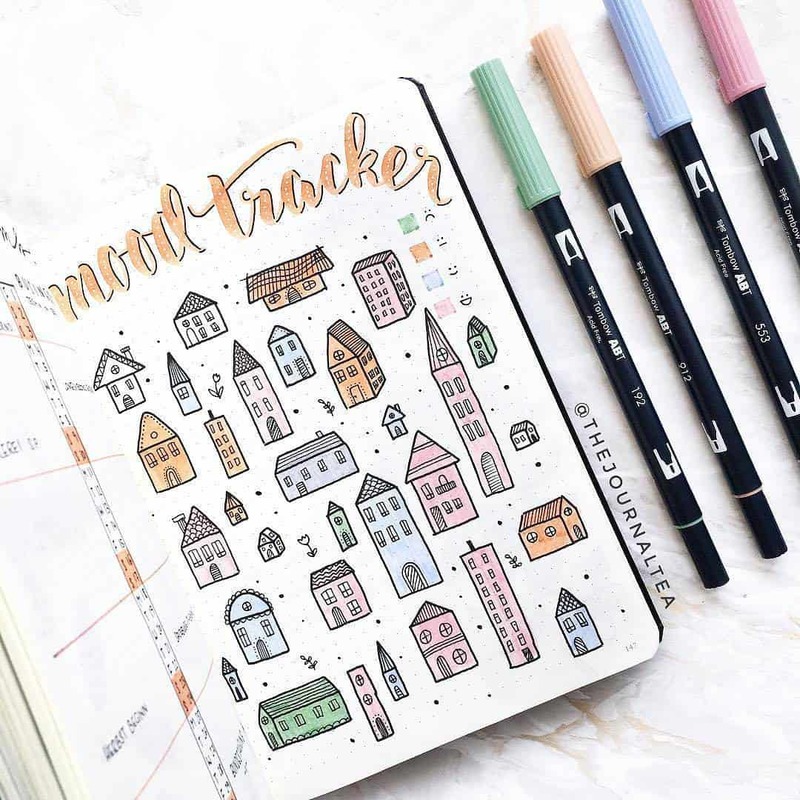 If you need some inspiration on how to set out your tracker just keep on scrolling because we’ve got 21 right here for you to put to the test! 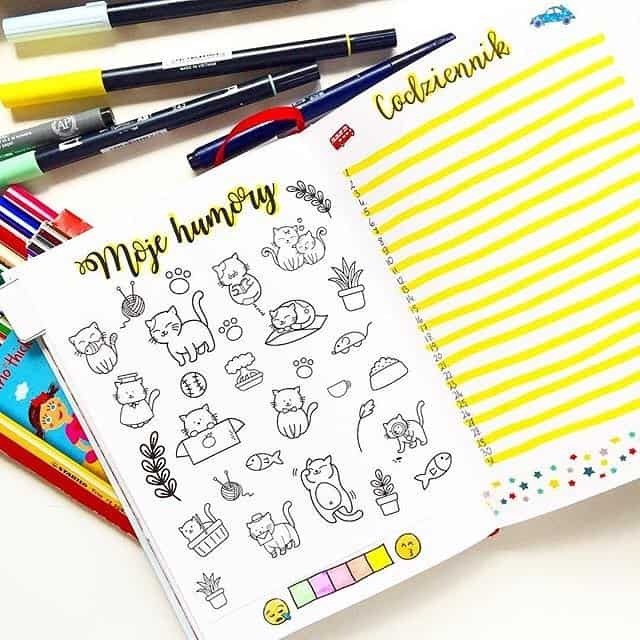 If you love cats then you need to try a mood tracker layout like this one with lots of cute kitty doodles! Or how about drawing a lighthouse and using the stripes around the building to track your emotional health over the month. Oh my goodness! 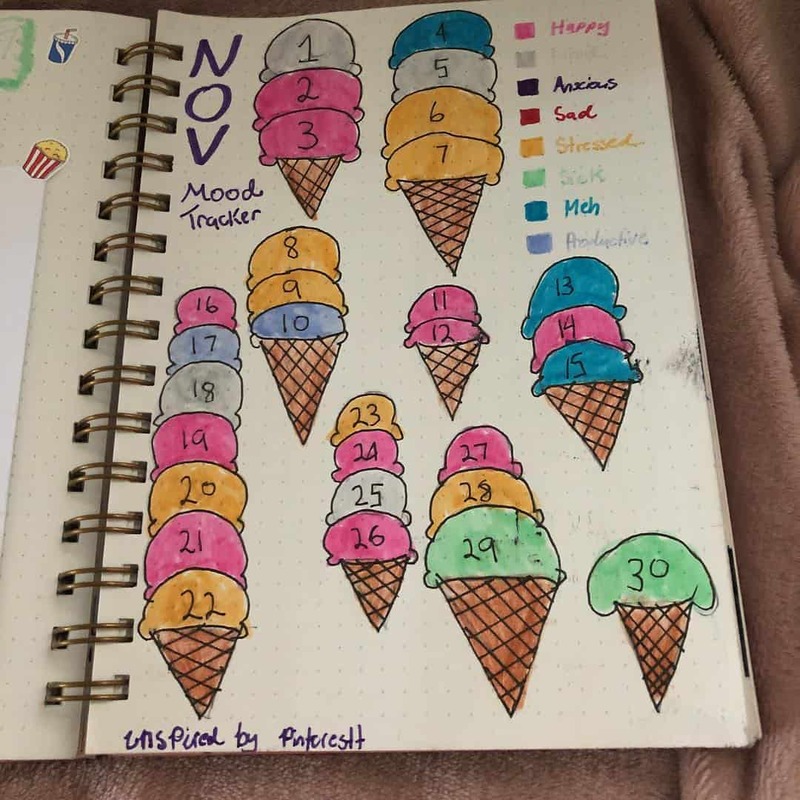 I think this has to be the most creative mood tracking spread I’ve ever seen. Color in the stripes on the zebras as the month goes by. 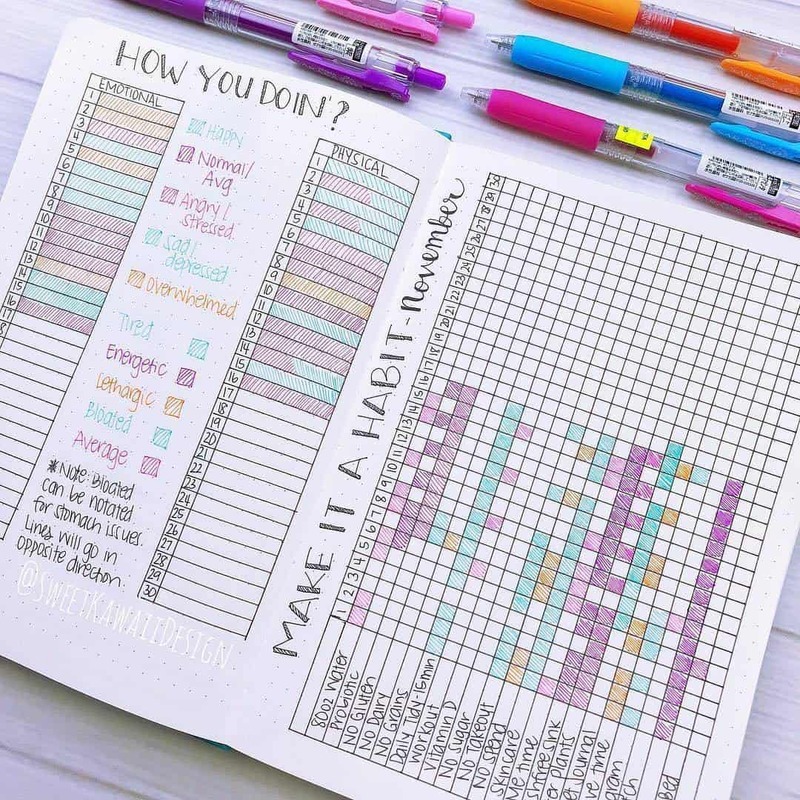 How about this for a really simple yet totally effective way to track your mental health. 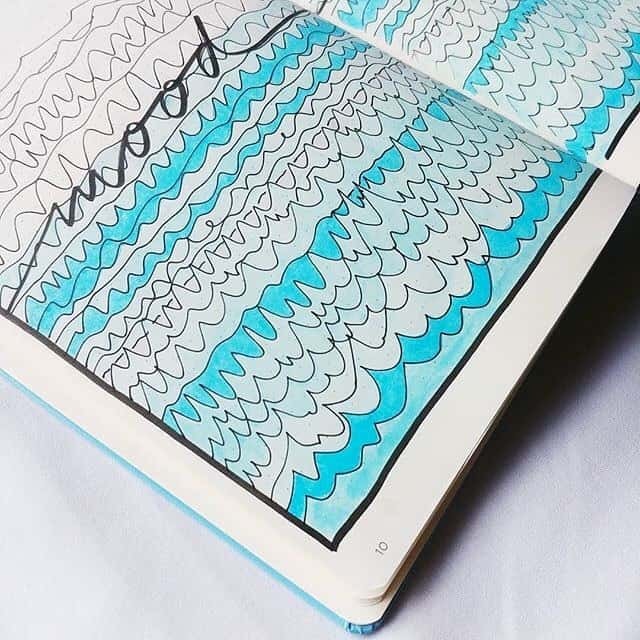 These waves are super simple to draw out in your journal. I actually feel calmer just looking at this spread! 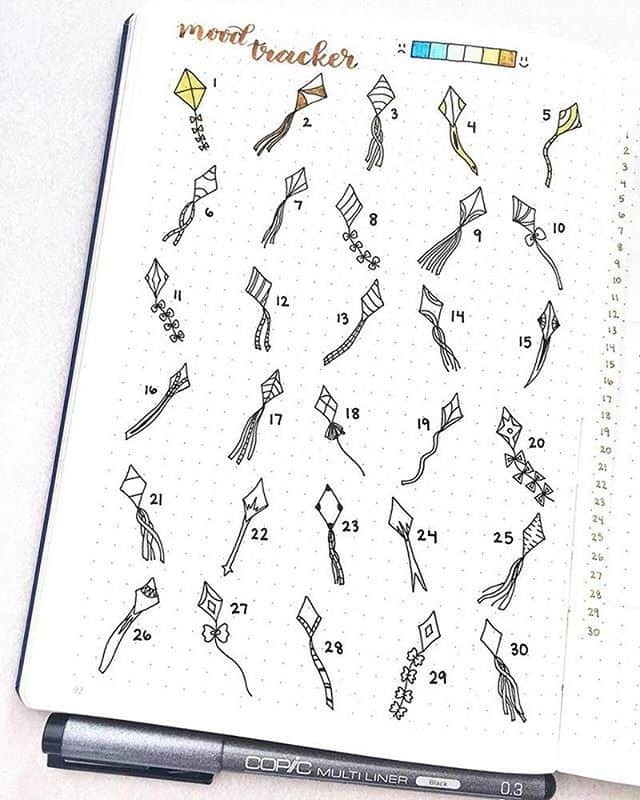 “Let’s go fly a kite… up to the highest height…” LOVE LOVE LOVE this kite themed mood tracker! I’ll be using this one myself next month! 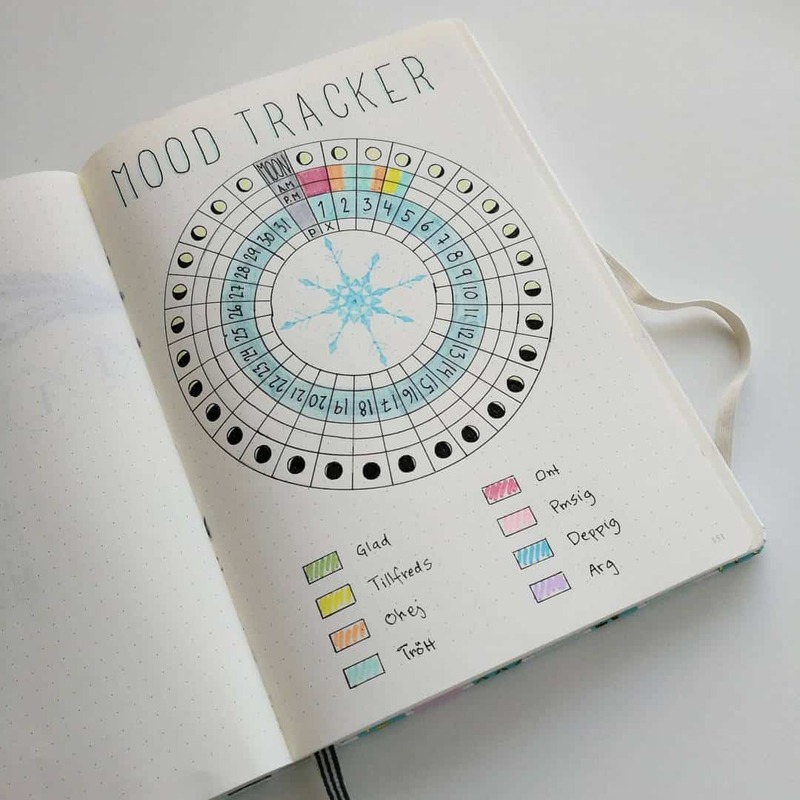 If you’ve ever wondered whether your mood swings relate to the cycles of the moon try a mood tracker layout like this one in your journal. You’ll need a stencil like this one to draw those nice neat circles. 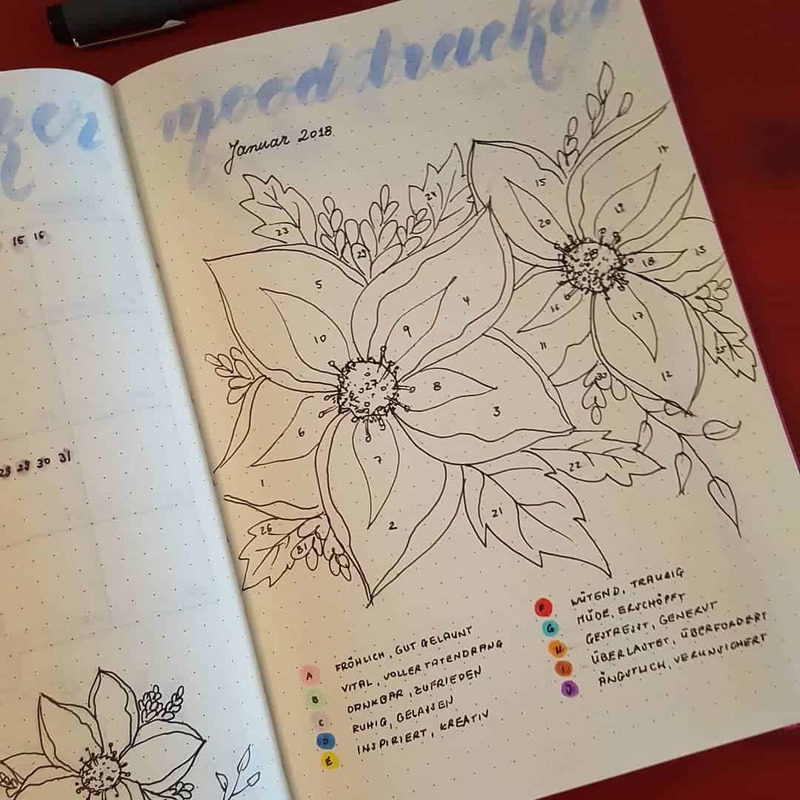 I love this layout and it’s perfect if you like doodling. Add some snow and it would have a real Christmas village feel to it making it the perfect way to track your mood in December. We love TomBow dual brush pens they’re great for journaling and colouring! If you love mandala try a tracking layout like this one. 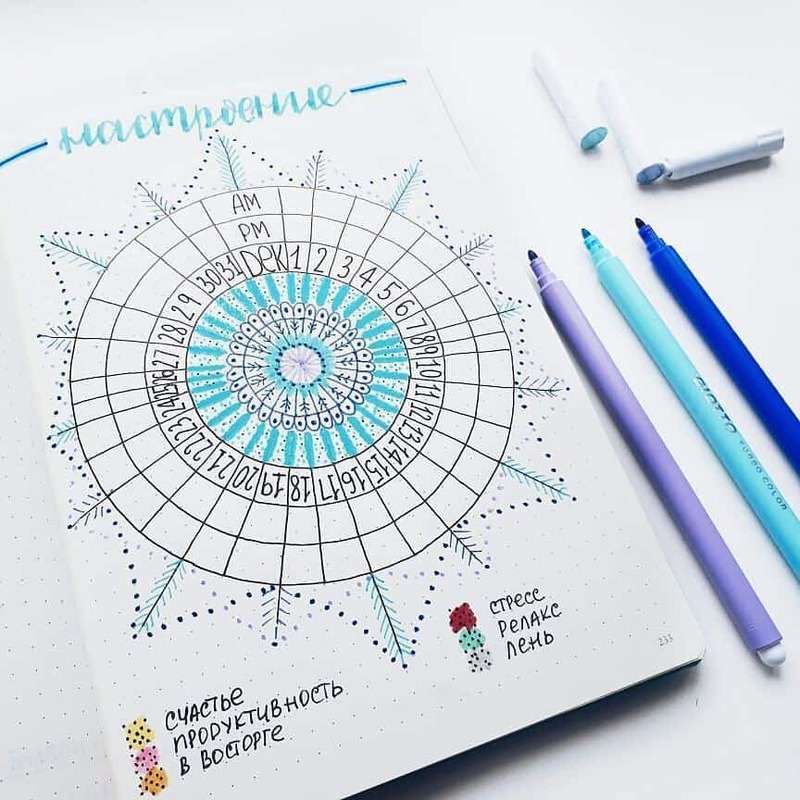 It serves a dual purpose, because not only can you track your mood but colouring helps you to relax. Here’s another layout that would be perfect for using in December. 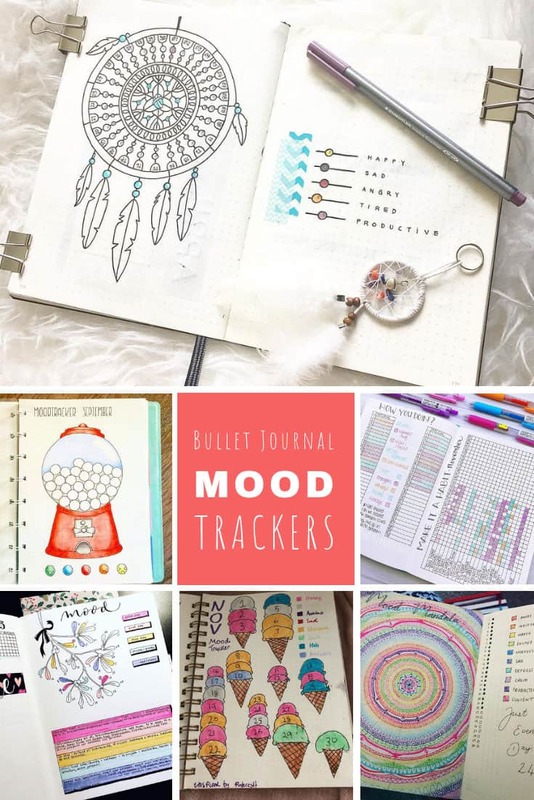 While you’re looking at these mood tracker Bullet Journal ideas look at the label names too since they’ll help you decide how you want to label your own emotions. 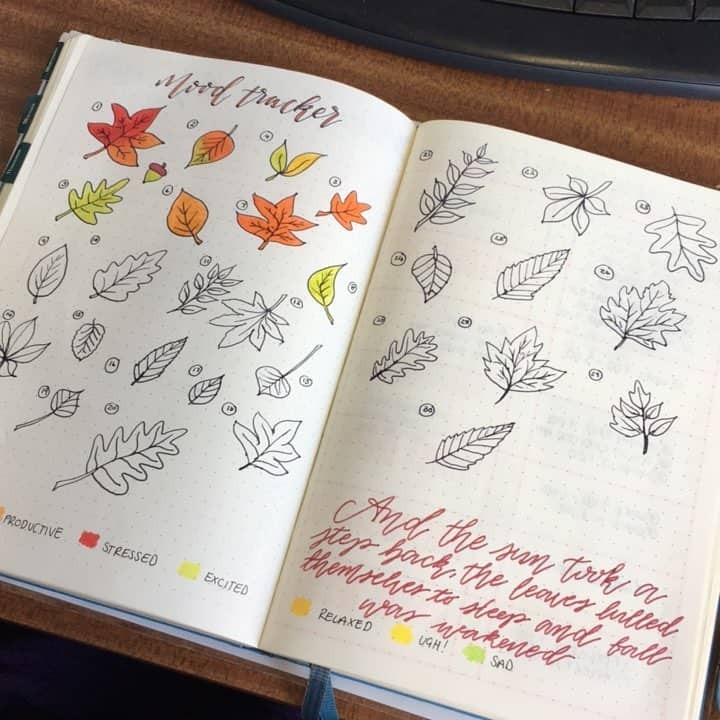 If you’re looking for a mood tracker layout you can use during the Fall months try one like this with lots of different leaves, and be sure to use seasonal colors for your different moods. 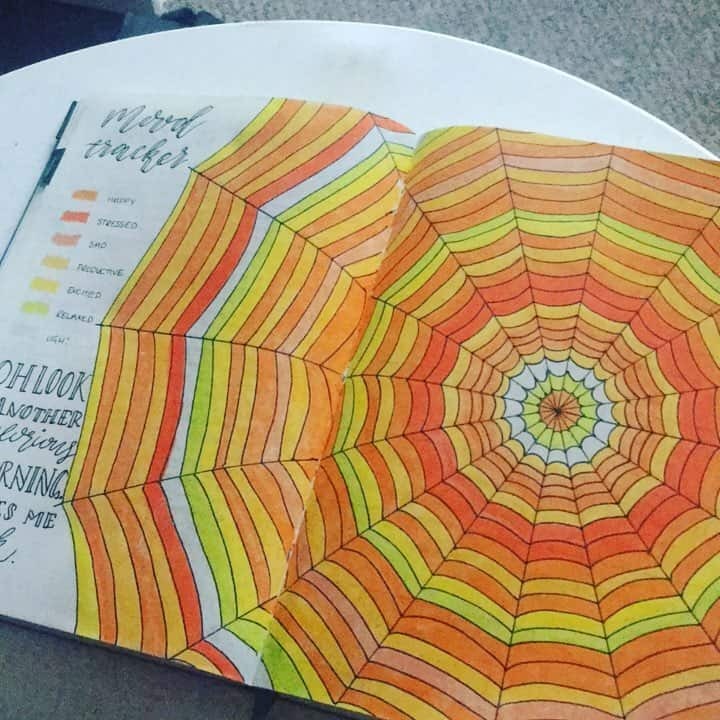 Or if you want a Halloween feel to your October mood tracker try a cobweb like this one. If you need more ideas for October check out these spooktastic Halloween mood tracker ideas! 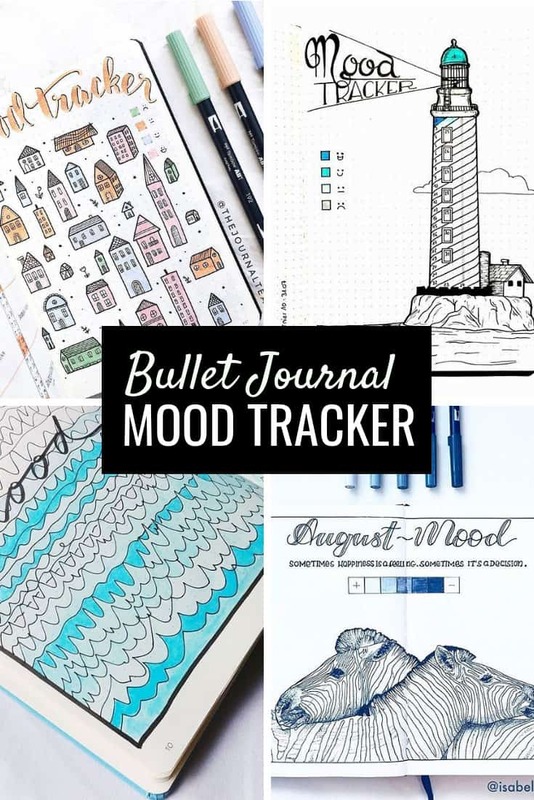 Sorry… couldn’t resist including a little Joey when I saw the title of this mood tracker! I like how this simple box tracker includes a space for your emotional states alongside your physical energy levels, because I definitely experience a correlation between the two. 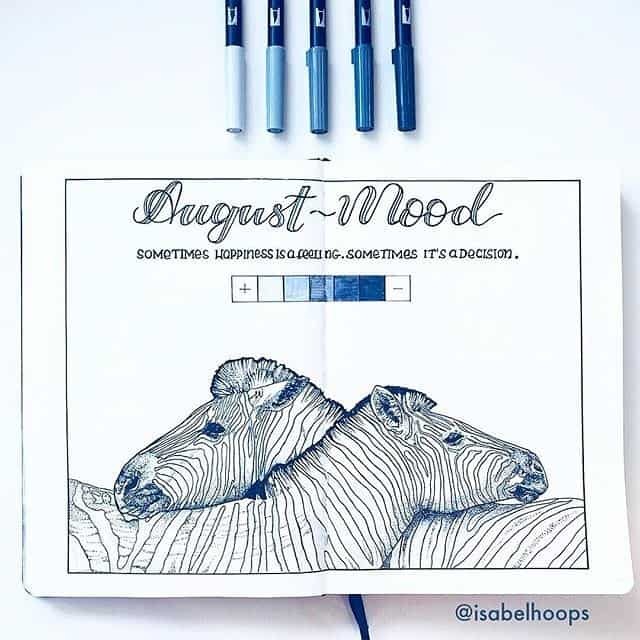 How’s this for a creative way to track your emotions? With ice cream scoops! 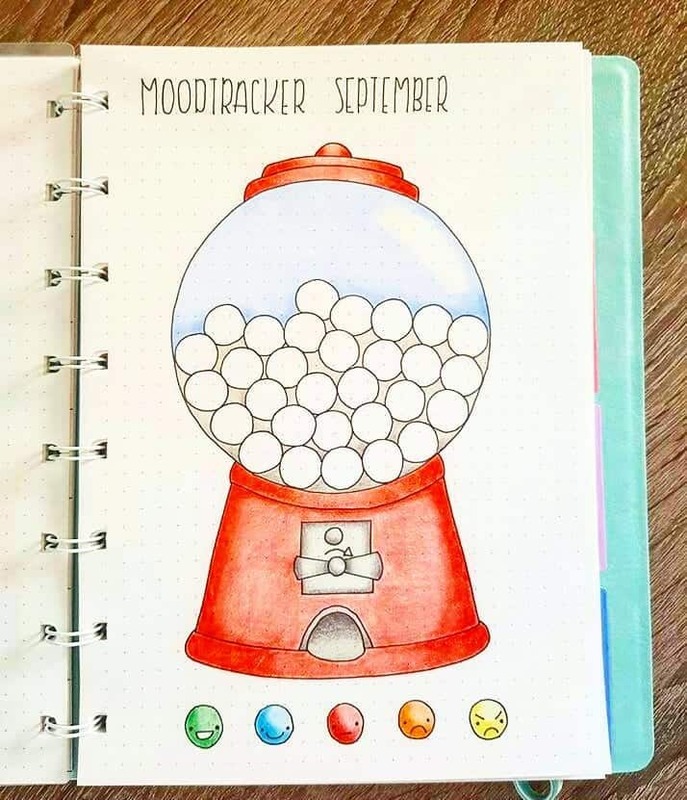 Or with a gum-ball machine, this gumball mood tracker is super clever and I like the way they chose facial expressions and not just colours for the balls! 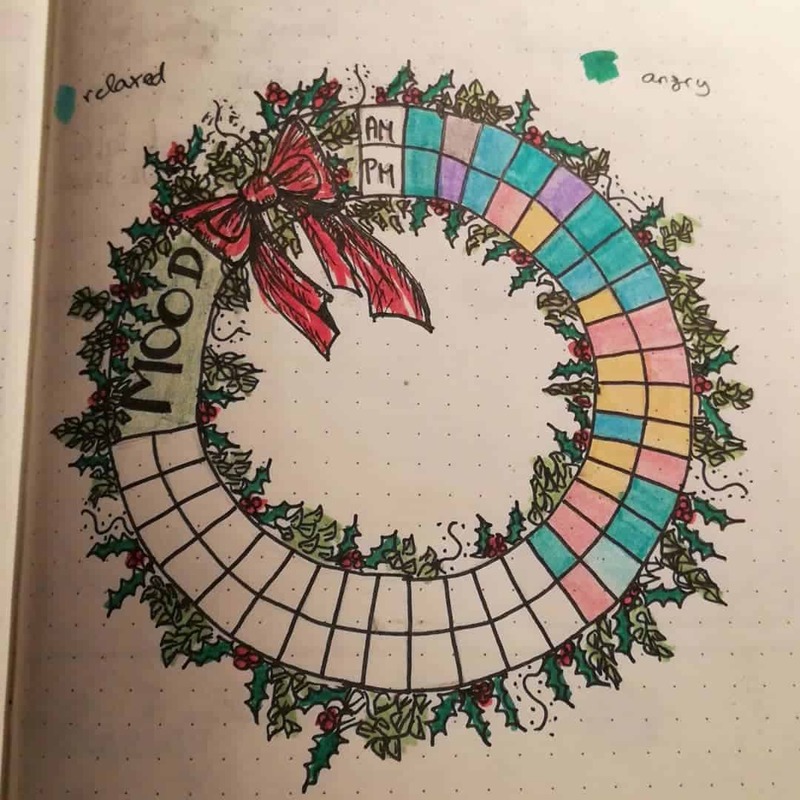 Christmas can get pretty stressful so it’s an important time of year to monitor your emotions, for a seasonal tracker layout try a pretty wreath like this one. We have a whole collection of Christmas mood tracker ideas for you! Or if mistletoe is more your thing try a layout like this one! Or how about drawing some gorgeous flowers and then using a colour by numbers chart to fill it in during the month? 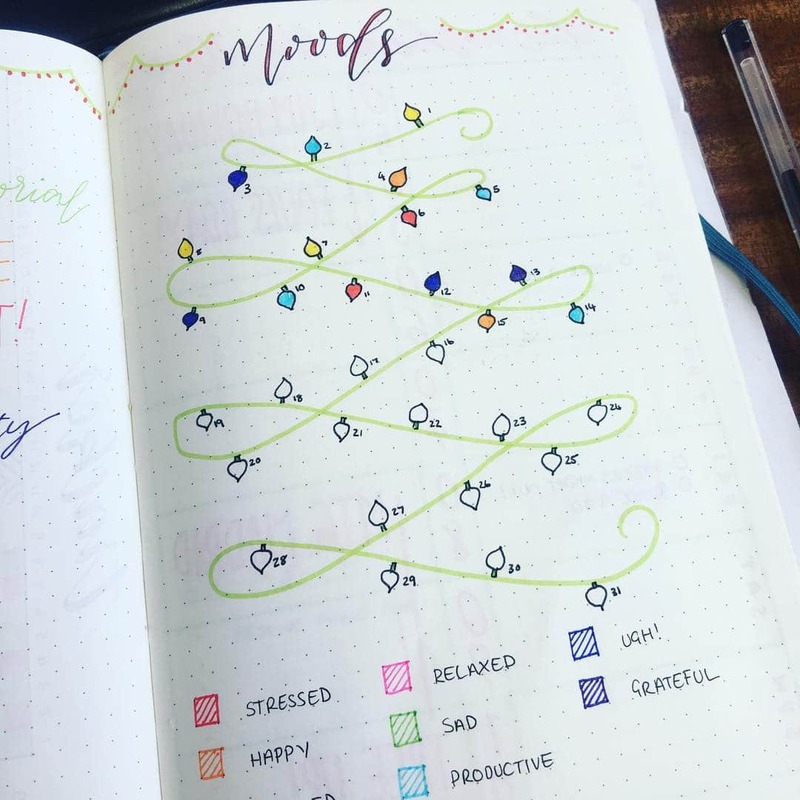 If you’ve already gotten into the habit of tracking your habits draw your mood tracker right there on the same page so you won’t forget to fill it in! 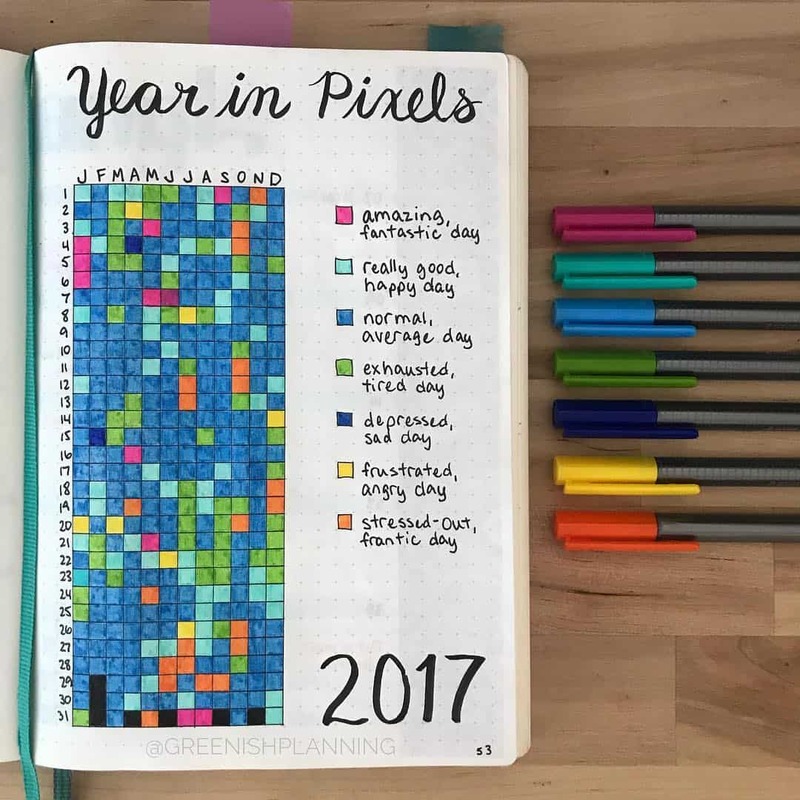 And of course you don’t have to do a monthly mood tracker, if you want to get an idea of your mood and emotions for a whole year at a glance try a Year in Pixels layout like this one. 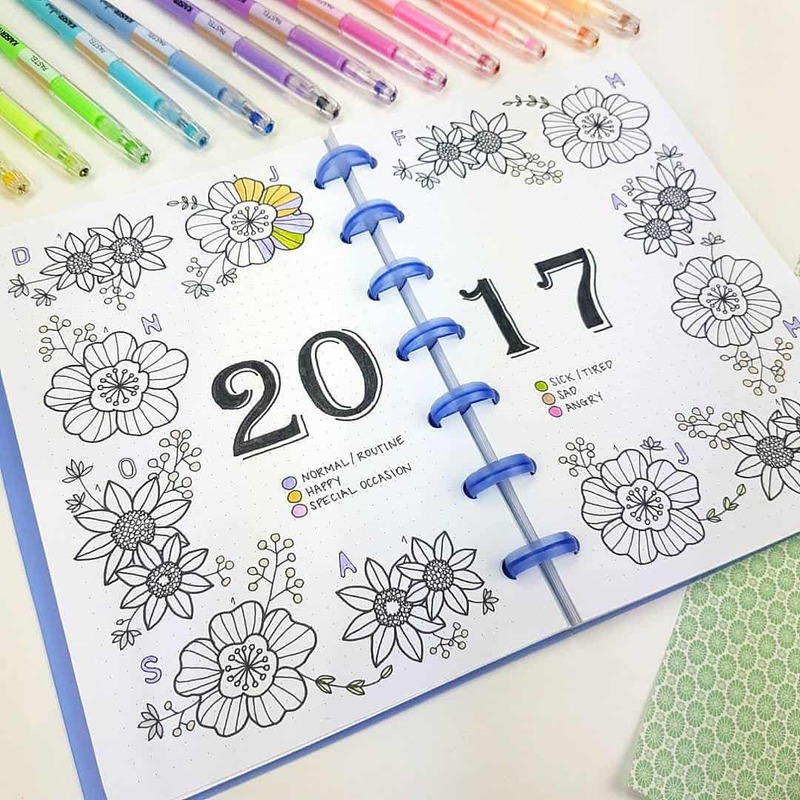 Or try a two-page spread with doodle flowers and colour in the petals of one set each month to get a year at a glance. I love this tree with heart shaped leaves on and of course it’s perfect for using in February. Ooh or try making a snowflake tracker for the winter months! If you’re a doodler and like drawing faces a cute layout like this one could work well for you. 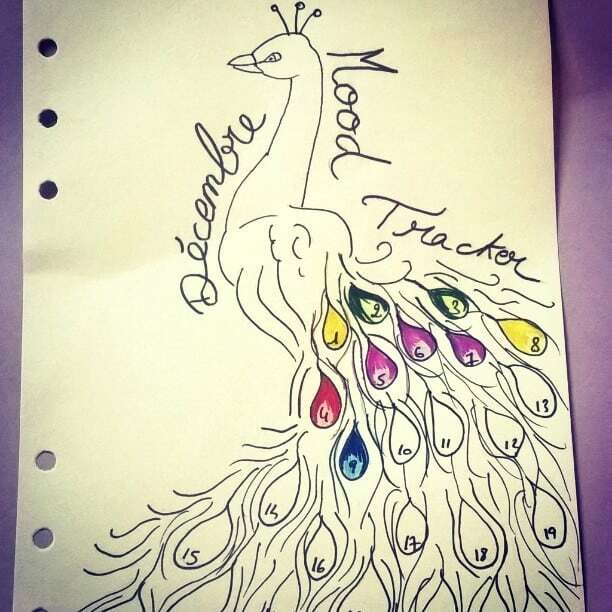 Or how about drawing a gorgeous peacock and decorating his tail feathers as the month goes by. 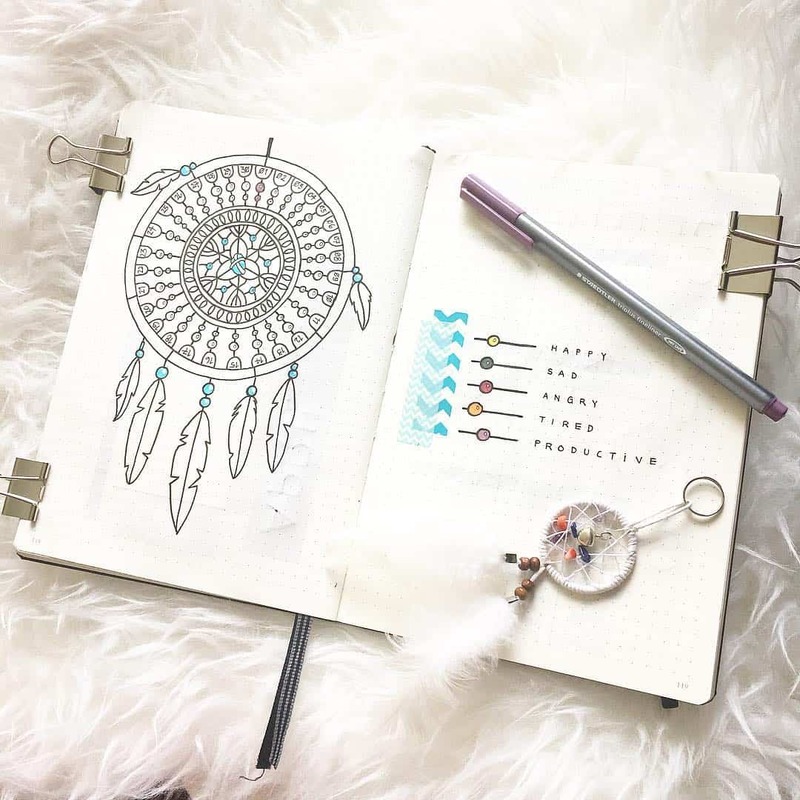 I love dream catchers and this one makes a beautiful circle mood tracker. If you’re a tea lover try a layout like this one, it would of course work with a coffee cup too!